Kaspersky Anti-Virus 2012 provides comprehensive protection of your computer against known and unknown threats, network and intruder attacks, spam and other unwanted information. Kaspersky Anti-Virus 2012 includes a new intellectual system of updates downloading. This system allows to download databases for the enabled application components, thus minimizing the volume of the downloaded updates and the time needed for download. Using Task Manager you can define how the system resources are consumed and review the status of executed tasks, thus optimizing computer resources. If you downloaded a file from the Internet and you doubt its security, check its reputation in Kaspersky Security Network using the file security detection function. System Watcher uses information collected by other components of the application. Once a malware is detected, its actions will be momentally blocked. All actions performed by applications are logged. Therefore, you will be able to roll back all malicious actions if an application is detected as a malware. Once you install Kaspersky Anti-Virus 2012, you will be able to easily switch to Kaspersky Internet Security 2012 to evaluate the product and then buy a license to the product. It is not required to install Kaspersky Internet Security 2012. 480 MB free disk space. CD/DVD-ROM (to install the application from the distribution CD). Internet connection to activate the application, update databases and application modules. 1 GB free RAM (for 32-bit operating systems); 2 GB free RAM (for 64-bit operating systems). Intel Atom 1.6 GHz or a compatible equivalent. Intel GMA950 with at least 64 MB of memory (or a compatible equivalent). Minimum screen resolution 1024 х 576. To install the application, run the setup file and follow the Setup Wizard's instructions. The installation procedure of Kaspersky Anti-Virus 2012 allows you to uninstall all applications that, when running simultaneously with Kaspersky Anti-Virus 2012, may cause slowdowns (up to complete non-operability) on the user's computer. 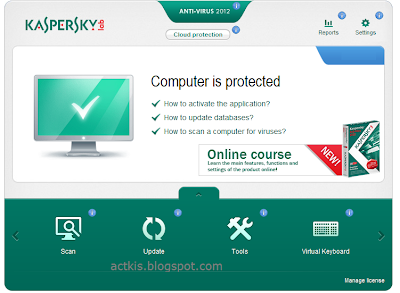 Kaspersky Anti-Virus 2012 is a comprehensive data protection tool. The application protects you from viruses and malware, unknown threats and Internet fraud. The multifaceted protection covers all channels for data transfer and exchange. Flexible configuration provided for each protection component lets users adapt Kaspersky Anti-Virus to their specific needs. The Task Manager, which allows you to view all completed scan tasks and those in progress, has been added. The redesigned interface of the main window now allows you to view all the necessary information about the computer protection status, activity of protection components, update status of anti-virus databases, and license validity period. The section providing information about the cloud protection, has been added. The search by key word, which allows you to find the required settings or functionality from the main window, has been added. Viewing of Kaspersky Lab news has been optimized. The support of touchscreens has been added. The gadget's design has been improved; also, the list of actions that can be performed using the gadget, has been expanded. The procedure for searching incompatible software has been improved, which allows to avoid conflicts between applications. The list of an application's actions that you can roll back if that application is considered to be malicious, has been expanded. The System Watcher technology has been improved: not only does it now collect information about actions performed by an application during the current session, but it also collects information during all the previous sessions. The application threat rating technology, which is based on the analysis of applications' behavior in other users' systems, has been improved. The option of checking the reputation of an application, its threat rating, and usage statistics from other users before running that application, has been added. The functionality of Kaspersky URL Advisor has been improved: the option of viewing additional information about categories of websites has been added. The list of supported web browsers has been expanded. The cloud protection has been significantly improved. A blend of cloud technologies and traditional signature methods ensures a high level of protection for your computer regardless of whether it is connected to the Internet constantly or not. Download of updates has been accelerated. The update process does not impact other running applications, conceding them priority in using the hard drive. Efficiency of protection against rootkits has been increased: the technologies designed for preventing the loading process of the operating system from being intercepted by malware, have been improved. The self-defense technology has been improved: it is now active since the very beginning of the application installation process, preventing attempts of disabling the anti-virus protection; it can be disabled upon the user's request only. The application's impact on the operating system's performance and the user's typical operations has been reduced. For example, the impact on the operating system's loading time and the applications' launching time has been reduced. The procedures of activating the application, purchasing and renewing the license have been simplified, as well as switching from the trial version to the commercial one. When installing Kaspersky Anti-Virus 2012 over the 2011 version, the previously activated additional license for the 2011 version will not be inherited by the 2012 version. If AVPTool (Kaspersky Virus Removal Tool) is detected on your computer during the installation, it is required that you either select automatic uninstallation of this application followed by reboot, or uninstall it manually. The limiting of the maximum size cannot be applied to Quarantine and Backup correctly. If File Anti-Virus has been paused by schedule, the Pause / Resume protection item misses in the context menu of the application. Some windows of the application don't follow completely MS recommendations regarding managing from keyboard (Tab, Alt-X). The application may return errors when copying updates to a non-existing folder. kaspersky antivirus 2012 activation code generator, kaspersky antivirus 2012 key, kaspersky antivirus free download, kaspersky antivirus free download 2012 full version with key, kav 2012 activation code, kav 2012 download. I have been activating my Kaspersky 2011 offline with key files for almost a year now. Initially, there was no trouble activating it because usually the key files work. However, recently, Kaspersky Laboratory have, apparently, found ways to block illegal keys instantly.